The bibliography that follows is intended as a complement to Acquisti‘s Economics of Privacy and Anderson‘s Economics and Security Resource Page. In addition, Ross has now constructed a a pscychology of security resource. The Economics of networks page maintainted by Nicholas Economides contains a bibliography and the excellent introductory article properly entitled "Economics of Networks". Another useful resource is Schneier on Security. Please see also the list of monographs in addition to this listing of papers and articles. Because this began a very long time ago, it remans organized by year. Click to the end or on a year in the table below. This bibliography, and the entire site, is maintained by Jean Camp. Contact her (or one of her current graduate students) at ljean.com for additions. predicted the rise of the market for vulnerabilities. C. Dwork and M. Naor, 1993, Pricing via Processing, Or, Combating Junk Mail , Advances in Cryptology CRYPTO92, Lecture Notes in Computer Science, Vol. 74, pp. 139-147, Springer. arguably the first economics of security work. Bruce Schnieier, No, we don‘t spend enough! , Workshop on the Economics of Information Security, 2002 May 16-17, Berkeley, CA, available online, at www2.sims.berkeley.edu/resources/affiliates/workshops/econsecurity/econws/18.doc. comment: we don‘t spend enough on security, and the risk is not fair to those who invest. comment: This careful, methodological paper describes how individuals can be identified from their call patterns alone. Assuming that web browsing has more information than simple number tracing, this has implications for privacy preferences. Gordon, Lawrence A., Martin P. Loeb and Tashfeen Sohail, A Framework for Using Insurance for Cyber Risk Management , Communications of the ACM, March 2003, pp. 81-85http://dl.acm.org/citation.cfm?id=636774 predicted the rise of the cyberinsurance market. Stephen R. Lewis, How Much is Stronger DRM Worth? , Second Workshop on the Economics of Information Security, 2003, College Park, MD, available online, at http://www.cpppe.umd.edu/rhsmith3/papers/Final_session1_lewis.pdf, (later published in pp. 53-58, Ch. 4, eds. L Jean Camp and Stephen Lewis, Economics of Information Security, Springer, Vol. 12, 2004, New York, NY). comment: competing with free requires frictionless commerce and a better experience. every dollar invested in DRM that results in a lower quality consumer experience is a dollar spent driving users to free, illegal but usable alternatives. Tony Vila and Rachel Greenstadt and David Molnar, Why We Can‘t be Bothered to Read Privacy Policies Models of Privacy Economics as a Lemons Market , Second Workshop on the Economics of Information Security, 2003, College Park, MD, available online, at http://www.cpppe.umd.edu/rhsmith3/papers/Final_session3_molnar.greenstadt.vila.pdf, (later published in pp. 143-154, Ch. 11, eds. L Jean Camp and Stephen Lewis, Economics of Information Security, Vol. 12, 2004, New York, NY). comment: Direct incentives are required to protect privacy. The market by itself will not reach a equilibrium where privacy policies are readable, read and reliable. Mauro Sandrini, We Want Security But We Hate It. The Foundations of Security Technoeconomics in the Social World , Second Workshop on the Economics of Information Security, 2003, College Park, MD, available online, at http://www.cpppe.umd.edu/rhsmith3/papers/Final_session8_sandrini.pdf, (later published in pp. 213-224, Ch. 16, eds. L Jean Camp and Stephen Lewis, Economics of Information Security, Springer, Vol. 12, 2004, New York, NY). comment: Individuals seek to escape for security technologies that are controlling. Consider the end user incentives when designing security systems. J Scott Marcus, "Evolving Core Capabilities of the Internet", Journal on Telecommunications and High Technology Law, 2004, available at: http://papers.ssrn.com/sol3/papers.cfm?abstract_id=921903. L Jean Camp and Allan Friedman, Good Neighbors Make Good Fences , Telecommunication Policy Research Conference, 2005, Arlington, VA.
available online, at https://www.zdnet.com/article/symantec-flaw-found-by-tippingpoint-bounty-hunters/, comment: first public report of a bug being purchased. Lambrinoudakis C., Gritzalis S., Yannacopoulos A., Hatzopoulos P., Katsikas S., A Formal Model for Pricing Information Systems Insurance Contracts, Computer Standards and Interfaces, Vol.27, No.5, pp.521-532, 2005. Alessandro Acquisti and Allan Friedman and Rahul Telang, Is There a Cost to Privacy Breaches? An Event Study , Fifth Workshop on the Economics of Information Security, 2006, Cambridge, UK, available online, at http://weis2006.econinfosec.org/docs/40.pdf. Alessandro Acquisti and Bin Zhang, Financial Privacy for Free? US Consumers Response to FACTA , Fifth Workshop on the Economics of Information Security, 2006, Cambridge, UK, available online, at http://weis2006.econinfosec.org/docs/45.pdf. Ashish Arora and Christopher M. Forman and Anand Nandkumar and Rahul Telang, Competitive and Strategic Effects in the Timing of Patch Release , Fifth Workshop on the Economics of Information Security, 2006, Cambridge, UK, available online, at http://weis2006.econinfosec.org/docs/35.pdf. Rainer Boehme and Thorsten Holz, The Effect of Stock Spam on Financial Markets , Fifth Workshop on the Economics of Information Security, 2006, Cambridge, UK, available online, at http://ssrn.com/abstract=897431. Rainer Boehme and Gaurav Kataria, Models and Measures for Correlation in Cyber-Insurance , Fifth Workshop on the Economics of Information Security, 2006, Cambridge, UK, available online, at http://weis2006.econinfosec.org/docs/16.pdf. L Jean Camp, Reliable, Usable Signaling to Defeat Masquerade Attacks , Fifth Workshop on the Economics of Information Security, 2006, Cambridge, UK, available online, at http://weis2006.econinfosec.org/docs/48.pdf. L Jean Camp, Mental Models of Security , IEEE Technology and Society,accepted in 2006. Huseyin Cavusoglu and Hasan Cavusoglu and Jun Zhang, Economics of Security Patch Management , Fifth Workshop on the Economics of Information Security, 2006, Cambridge, UK, available online, at http://weis2006.econinfosec.org/docs/5.pdf. Michael Collins and Carrie Gates and Gaurav Kataria, A Model for Opportunistic Network Exploits: The Case of P2P Worms , Fifth Workshop on the Economics of Information Security, 2006, Cambridge, UK, available online, at http://weis2006.econinfosec.org/docs/30.pdf. Marco Cremonini and Dmitri Nizovtsev, Understanding and Influencing Attackers' Decisions: Implications for Security Investment Strategies , Fifth Workshop on the Economics of Information Security, 2006, Cambridge, UK, available online, at http://weis2006.econinfosec.org/docs/3.pdf. George Danezis and Bettina Wittneben, The Economics of Mass Surveillance and the Questionable Value of Anonymous Communications , Fifth Workshop on the Economics of Information Security, 2006, Cambridge, UK, available online, at http://weis2006.econinfosec.org/docs/36.pdf. Roger Dingledine and Nick Mathewson, Anonymity Loves Company: Usability and the Network Effect , Fifth Workshop on the Economics of Information Security, 2006, Cambridge, UK, available online, at http://weis2006.econinfosec.org/docs/41.pdf. Benjamin Edelman, Adverse Selection in Online 'Trust' Certifications , Fifth Workshop on the Economics of Information Security, 2006, Cambridge, UK, available online, at http://weis2006.econinfosec.org/docs/10.pdf. A. Friedman, 2006, Information Networks and Social Trust , Kennedy School of Government Working Paper Series, Cambridge, MA, comment: defines the limits and efficacy of information-sharing among naive users who are attempting to jointly identify "good" or "bad" sites, i.e. limits of social networks for security. uses agent-based modeling. 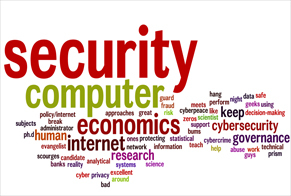 Garcia, Alfredo and Barry Horowitz, The Potential for Underinvestment in Internet Security : Implications for Regulatory Policy , Journal of Regulatory Economics, 2006. Alfredo Garcia and Barry Horowitz, The Potential for Underinvestment in Internet Security: Implications for Regulatory Policy , Fifth Workshop on the Economics of Information Security, 2006, Cambridge, UK, available online, at http://weis2006.econinfosec.org/docs/24.pdf. Anindya Ghose and Uday Rajan, The Economic Impact of Regulatory Information Disclosure on Information Security Investments, Competition, and Social Welfare , Fifth Workshop on the Economics of Information Security, 2006, Cambridge, UK, available online, at http://weis2006.econinfosec.org/docs/37.pdf. comment:people still install spyware when told what it is but they feel good about it. Gordon, Lawrence A., Martin, P. Loeb, William Lucyshyn, and Tashfeen Sohail, The Impact of the Sarbanes-Oxley Act on the Corporate Disclosures of Information Security Activities , Journal of Accounting and Public Policy, Vol. 25, No. 5, 2006, pp. 503-530. Lawrence A. Gordon and Martin P. Loeb, Managing Cybersecurity Resources: A Cost-Benefit Analysis, McGraw-Hill, 2006, NY, NY. Rachel Greenstadt and Michael D. Smith, Collaborative Scheduling: Threats and Promises , Fifth Workshop on the Economics of Information Security, 2006, Cambridge, UK, available online, at http://weis2006.econinfosec.org/docs/43.pdf. Hemantha Herath and Tejaswini Herath, Justifying Spam and E-mail Virus Security Investments: A Case Study , Fifth Workshop on the Economics of Information Security, 2006, Cambridge, UK, available online, at http://weis2006.econinfosec.org/docs/13.pdf. Matthew Hottell and Drew Carter and Matthew Deniszczuk, Predictors of Home-Based Wireless Security , Fifth Workshop on the Economics of Information Security, 2006, Cambridge, UK, available online, at http://weis2006.econinfosec.org/docs/51.pdf. C. Derrick Huang and Qing Hu and Ravi S. Behara, Economics of Information Security Investment in the Case of Simultaneous Attacks , Fifth Workshop on the Economics of Information Security, 2006, Cambridge, UK, available online, at http://weis2006.econinfosec.org/docs/15.pdf. comment: measures the degree to which spam is randomly distributed or targeted. spam is most strongly correlated with the account provider for free email, opting out of marketing opportunities does decrease spam. comment: Growth in malicious software drives revenue totaling $4 billion for anti-virus companies, .......... enterprise share of the antivirus market in 2005 was 51.5 percent while the consumer segment came in at 48.5 percent. Vineet Kumar and Rahul Telang and Tridas Mukhopadhyay, Enterprise Information Security: Who Should Manage it and How? , Fifth Workshop on the Economics of Information Security, 2006, Cambridge, UK, available online, at http://weis2006.econinfosec.org/docs/21.pdf. Debin Liu and L Jean Camp, Proof of Work can Work , Fifth Workshop on the Economics of Information Security, 2006, Cambridge, UK, available online, at http://weis2006.econinfosec.org/docs/50.pdf. comment: the difference in the production frontier can be overcome by embedding proof of work into current anti-spam systems which include reputation systems, white lists, and black lists. Wei Liu and Hideyuki Tanaka and Kanta Matsuura, An Empirical Analysis of Security Investment in Countermeasures Based on an Enterprise Survey in Japan , Fifth Workshop on the Economics of Information Security, 2006, Cambridge, UK, available online, at http://weis2006.econinfosec.org/docs/9.pdf. I. MacInnes, Y. Li Risk and Dispute in eBay Transactions , International Journal of Electronic Commerce. comment: not the nature of the good nor the size of the transaction but rather the payment method is the greatest predictor of dispute in eBay transactions. Tyler Moore, The Economics of Digital Forensics , Fifth Workshop on the Economics of Information Security, 2006, Cambridge, UK, available online, at http://weis2006.econinfosec.org/docs/14.pdf. Shishir Nagaraja and Ross Anderson, The Topology of Covert Conflict , Fifth Workshop on the Economics of Information Security, 2006, Cambridge, UK, available online, at http://weis2006.econinfosec.org/docs/38.pdf. Andy Ozment and Stuart E. Schechter, Bootstrapping the Adoption of Internet Security Protocols , Fifth Workshop on the Economics of Information Security, 2006, Cambridge, UK, available online, at http://weis2006.econinfosec.org/docs/46.pdf. Shari Lawrence Pfleeger and Rachel Rue and Jay Horwitz and Aruna Balakrishnan, Investing In Cyber Security: The Path to Good Practice , 2006, The RAND Journal. Brent R. Rowe and Michael P. Gallaher, Private Sector Cyber Security Investment: An Empirical Analysis , Fifth Workshop on the Economics of Information Security, 2006, Cambridge, UK, available online, at http://weis2006.econinfosec.org/docs/18.pdf. Peter Sand, The Privacy Value , Journal of Law and Policy for the Information Society, Summer 2006. Michael Sutton and Frank Nagle, Emerging Economic Models for Vulnerability Research , Fifth Workshop on the Economics of Information Security, 2006, Cambridge, UK, available online, at http://weis2006.econinfosec.org/docs/17.pdf. R. Wash and J. K. MacKie-Mason, Incentive-centered design for information security. 1st Conference on USENIX Workshop on Hot Topics in Security - Volume 1 (Vancouver, B.C., Canada). August 2006. Jan Willemson, On the Gordon & Loeb Model for Information Security Investment , Fifth Workshop on the Economics of Information Security, 2006, Cambridge, UK, available online, at http://weis2006.econinfosec.org/docs/12.pdf. David S. Anderson, Chris Fleizach, Stefan Savage and Geoffrey M. Voelker, Spamscatter: Characterizing Internet Scam Hosting Infrastructure, USENIX Security Symposium, Boston, MA. 5 -10 August 2007. R. Anderson, T. Moore, S. Nagaraja, A. Ozment, Incentives and Information Security , in Algorithmic Game Theory, N. Nisan, T. Roughgarden, E. Tardos, and V. Vazirani (editors), ISBN-13: 9780521872829, Cambridge University Press, 2007. Ross Anderson and Tyler Moore. "The Economics of Information Security: A Survey and Open Questions." Fourth bi-annual Conference on the Economics of the Software and Internet Industries, January 19-20, 2007, Toulouse, France. Farzaneh Asgharpour, Debin Liu, L. Jean Camp Mental Models of Computer Security Risks, WEIS 2007 - Sixth Workshop on Economics of Information Security, Pittsburgh PA, 7-8 June 2007. S. E. Goodman, Robert Ramer, Identify and Mitigate the Risks of Global IT Outsourcing , Editorial Preface, The Journal of Global Information Technology Management (JGITM), Vol. 10, No. 4, October 2007, 1-6. Seymour E. Goodman, Rob Ramer, Global Sourcing of IT Services and Information Security: Prudence Before Playing Comm. of the American Association for Information Systems (CAIS), Vol, 20, December 2007, 812-823. Steven M. Bellovin, Routing Security Economics DIMACS Workshop on Information Security Economics January 18 - 19, 2007 DIMACS Center, Rutgers, NJ. Rainer Böhme and Sven Koble, Technische Universität Dresden, On the Viability of Privacy-Enhancing Technologies in a Self-Regulated Business-to-Consumer Market: Will Privacy Remain a Luxury Good?, WEIS 2007 - Sixth Workshop on Economics of Information Security, Pittsburgh PA, 7-8 June 2007. Ramnath K. Chellappa, Shivendu Shivendu, Incentive Design for Free but No Free Disposal Services: The Case of Personalization under Privacy Concerns, WEIS 2007 - Sixth Workshop on Economics of Information Security, Pittsburgh PA, 7-8 June 2007. Pau-Chen Chen, Pankaj Rohatgi and Claudia Keser, Fuzzy MLS: An Experiment on Quantified Risk-Adaptive Access Control DIMACS Workshop on Information Security Economics January 18 - 19, 2007 DIMACS Center, Rutgers, NJ. Yue Chen, Barry Boehm, Luke Sheppard,Measuring Security Investment Benefit for Off the Shelf Software Systems - A Stakeholder Value Driven Approach, WEIS 2007 - Sixth Workshop on Economics of Information Security, Pittsburgh PA, 7-8 June 2007. Jay Pil Choi, Chaim Fershtman, Neil Gandal Network Security: Vulnerabilities and Disclosure Policy, WEIS 2007 - Sixth Workshop on Economics of Information Security, Pittsburgh PA, 7-8 June 2007. Lorrie Faith Cranor, Sarah Spiekermann, Privacy Engineering DIMACS Workshop on Information Security Economics January 18 - 19, 2007 DIMACS Center, Rutgers, NJ. Nicolas Christin, Countermeasures Against Government-Scale Monetary Forgeries, DIMACS Workshop on Information Security Economics January 18 - 19, 2007 DIMACS Center, Rutgers, NJ. George Danezis, Network formation, Sybil Attacks & Reputation Systems, DIMACS Workshop on Information Security Economics January 18 - 19, 2007 DIMACS Center, Rutgers, NJ. George Danezis and Stefan Schiffner, On Network formation, (Sybil attacks and Reputation systems) DIMACS Workshop on Information Security Economics January 18 - 19, 2007 DIMACS Center, Rutgers, NJ. Scott Dynes, Information Security and IT Risk Management in the Real World:Results From Field Studies DIMACS Workshop on Information Security Economics January 18 - 19, 2007 DIMACS Center, Rutgers, NJ. Jason Franklin, Vern Paxon, Adrian Perrig, and Stefan Savage, An Inquiry into the Nature and Causes of the Wealth of Internet Miscreants, CCS '07, Alexandria, VA. 29 October - 2 November, 2007. M. Eric Johnson and Scott Dynes, Inadvertent Disclosure - Information Leaks in the Extended Enterprise, WEIS 2007 - Sixth Workshop on Economics of Information Security, Pittsburgh PA, 7-8 June 2007. Neil Gandal, Internet Security, Vulnerability Disclosure, & Software Provision, DIMACS Workshop on Information Security Economics January 18 - 19, 2007 DIMACS Center, Rutgers, NJ. Eric Goetz and M.Eric Johnson, Embedding Information Security Risk Management into the Extended Enterprise , 2006. Available online at http://mba.tuck.dartmouth.edu/digital/Programs/CorporateEvents/CIO_RiskManage/Overview.pdf, WEIS 2007 - Sixth Workshop on Economics of Information Security, Pittsburgh PA, 7-8 June 2007. Gritzalis S., Yannacopoulos A., Lambrinoudakis C., Hatzopoulos P., Katsikas S., A Probabilistic Model for Optimal Insurance Contracts against Security Risks and Privacy Violation in IT Outsourcing Environments , International Journal of Information Security, Vol.6, No.4, pp.197-211, 2007. Jens Grossklags, Alessandro Acquisti, When 25 Cents is too much: An Experiment on Willingness-To-Sell and Willingness-To-Protect Personal Information, WEIS 2007 - Sixth Workshop on Economics of Information Security, Pittsburgh PA, 7-8 June 2007. Alok Gupta and Dmitry Zhdanov, Growth and sustainability of MSSP networks, WEIS 2007 - Sixth Workshop on Economics of Information Security, Pittsburgh PA, 7-8 June 2007. Kjell Hausken, Strategic Defense and Attack of Complex Networks, WEIS 2007 - Sixth Workshop on Economics of Information Security, Pittsburgh PA, 7-8 June 2007. Hemantha S. B. Herath, Tejaswini C. Herath, Cyber-Insurance: Copula Pricing Framework and Implications for Risk Management, WEIS 2007 - Sixth Workshop on Economics of Information Security, Pittsburgh PA, 7-8 June 2007. Peter Honeyman, Galina A. Schwartz, Ari Van Assche, Interdependence of Reliability and Security, WEIS 2007 - Sixth Workshop on Economics of Information Security, Pittsburgh PA, 7-8 June 2007. Barry Horowitz, Linking the Economics of Cyber Security and Corporate Reputation DIMACS Workshop on Information Security Economics January 18 - 19, 2007 DIMACS Center, Rutgers, NJ. Gaurav Kataria, Rainer Böhme, Models and Measures for Correlation in Cyber-Insurance DIMACS Workshop on Information Security Economics January 18 - 19, 2007 DIMACS Center, Rutgers, NJ. Vineet Kumar, Rahul Telang, Tridas Mukhopadhyay, Carnegie Mellon University,Optimally Securing Enterprise Information Systems and Assets, WEIS 2007 - Sixth Workshop on Economics of Information Security, Pittsburgh PA, 7-8 June 2007. Costas Lambrinoudakis, Stefanos Gritzalis, and Thanassis Yannacopoulos, Modelling and Economics of IT Risk Management and Insurance DIMACS Workshop on Information Security Economics January 18 - 19, 2007 DIMACS Center, Rutgers, NJ. Ivan Png, Chen Yu Wang, The Deterrent Effect of Enforcement Against Computer Hackers: Cross-Country Evidence, WEIS 2007 - Sixth Workshop on Economics of Information Security, Pittsburgh PA, 7-8 June 2007. Amalia R. Miller,Catherine E. Tucker,Privacy, Network Effects and Electronic Medical Record Technology Adoption, WEIS 2007 - Sixth Workshop on Economics of Information Security, Pittsburgh PA, 7-8 June 2007. Charles Miller, The legitimate vulnerability market: the secretive world of 0-day exploit sales, WEIS 2007 - Sixth Workshop on Economics of Information Security, Pittsburgh PA, 7-8 June 2007. Tyler Moore and Richard Clayton An Empirical Analysis of the Current State of Phishing Attack and Defence, WEIS 2007 - Sixth Workshop on Economics of Information Security, Pittsburgh PA, 7-8 June 2007. Tyler Moore, (joint with Ross Anderson and Shishir Nagaraja), Network Economics and Security Engineering DIMACS Workshop on Information Security Economics January 18 - 19, 2007 DIMACS Center, Rutgers, NJ. Deirdre K. Mulligan, Information Disclosure as a light-weight regulatory mechanism DIMACS Workshop on Information Security Economics January 18 - 19, 2007 DIMACS Center, Rutgers, NJ. Mohammad S. Rahman Karthik Kannan, Mohit Tawarmalani, Purdue University,The Countervailing Incentive of Restricted Patch Distribution: Economic and Policy Implications, WEIS 2007 - Sixth Workshop on Economics of Information Security, Pittsburgh PA, 7-8 June 2007. Srinivasan Raghunathan, Huseyin Cavusoglu, Byungwan Koh, Bin Mai, Economics of User Segmentation, Profiling, and Detection in Security, WEIS 2007 - Sixth Workshop on Economics of Information Security, Pittsburgh PA, 7-8 June 2007. Brent Rowe,Will Outsourcing IT Security Lead to a Higher Social Level of Security?, WEIS 2007 - Sixth Workshop on Economics of Information Security, Pittsburgh PA, 7-8 June 2007. Rachel Rue, Shari Lawrence Pfleeger, David Ortiz,A Framework for Classifying and Comparing Models of Cyber Security Investment to Support Policy and Decision-Making, WEIS 2007 - Sixth Workshop on Economics of Information Security, Pittsburgh PA, 7-8 June 2007. Bruce Schneier, The Psychology of Security... a work in progress DIMACS Workshop on Information Security Economics January 18 - 19, 2007 DIMACS Center, Rutgers, NJ. Katherine J. Strandburg, Surveillance of Emergent Associations: Freedom of Association in a Network Society DIMACS Workshop on Information Security Economics January 18 - 19, 2007 DIMACS Center, Rutgers, NJ. Michael D. Smith and Rahul Telang, Competing with Free: The Impact of Movie Broadcasts on DVD Sales and Internet Piracy DIMACS Workshop on Information Security Economics January 18 - 19, 2007 DIMACS Center, Rutgers, NJ. Peter Swire, Security Through Obscurity: When It Works, When It Doesn't DIMACS Workshop on Information Security Economics January 18 - 19, 2007 DIMACS Center, Rutgers, NJ. Janice Tsai, Serge Egelman, Lorrie Cranor, Alessandro Acquisti, The Effect of Online Privacy Information on Purchasing Behavior: An Experimental Study, WEIS 2007 - Sixth Workshop on Economics of Information Security, Pittsburgh PA, 7-8 June 2007. Rick Wash and Jeff Mackie-Mason Incentive-Centered Design for Information Security, DIMACS Workshop on Information Security Economics January 18 - 19, 2007 DIMACS Center, Rutgers, NJ. Hartline, Jason D., and Tim Roughgarden. Optimal mechanism design and money burning Proceedings of the 40th annual ACM symposium on Theory of computing. ACM, 2008. Greg Aaron, Rod Rasmussen, Global Phishing Survey: Domain Name Use and Trends in 1H2008, General Members Meeting & eCrime Researchers Summit, Atlanta 14-16 October 2008. Sang Hoo Bae, Pilsik Choi, Firms' Optimal Digital Rights Management (DRM) Strategies: The Effects of Public Copy Protection and DRM Compatibility, WEIS 2008 - Seventh Workshop on Economics of Information Security, Hanover NH, 25-28 June 2008. Rainer Boehme, Conformity or Diversity: Social Implications of Transparency in Personal Data Processing, WEIS 2008 - Seventh Workshop on Economics of Information Security, Hanover NH, 25-28 June 2008. Garth Bruen, Chris Barton The Phantom Menace: Untraceable Registrars, General Members Meeting & eCrime Researchers Summit, Atlanta 14-16 October 2008. Pat Cain, IODEF Extensions: A Lingua Franca for Communicating and Processing Electronic Crime Reports, General Members Meeting & eCrime Researchers Summit, Atlanta 14-16 October 2008. L. Jean Camp, Hillary Elmore, Brandon Stephens, Diffusion and Adoption of IPv6 in the United States, WEIS 2008 - Seventh Workshop on Economics of Information Security, Hanover NH, 25-28 June 2008. Ramnath Chellappa, Raymond Sin, Competition for Information under Privacy Concerns, WEIS 2008 - Seventh Workshop on Economics of Information Security, Hanover NH, 25-28 June 2008. Anindya Ghose, Karthik Balakrishnan, Panos Ipeirotis, The Impact of Information Disclosure on Stock Market Returns: The Sarbanes-Oxley Act and the Role of Media as an Information Intermediary, WEIS 2008 - Seventh Workshop on Economics of Information Security, Hanover NH, 25-28 June 2008. Rachel Greenstadt, Oliver Day, Brandon Palmen, Reinterpreting the Disclosure Debate for Web Infections, WEIS 2008 - Seventh Workshop on Economics of Information Security, Hanover NH, 25-28 June 2008. Jens Grossklags, Nicolas Christin, John Chuang, Security Investment (Failures) in Five Economic Environments: A Comparison of Homogeneous and Heterogeneous User Agents, WEIS 2008 - Seventh Workshop on Economics of Information Security, Hanover NH, 25-28 June 2008. Il-Horn Hann, Kai-Lung Hui, Sang-Yong T. Lee, and I.P.L. Png, Consumer Privacy and Marketing Avoidance: A Static Model, Management Science, Vol. 54 No. 6, June 2008, 1094-1103. Introduces the concept of marketing avoidance, i.e., consumer efforts to conceal themselves and to deflect marketing. Rolf Hulthen, Communicating the Economic Value of Security Investments; Value at Security Risk, WEIS 2008 - Seventh Workshop on Economics of Information Security, Hanover NH, 25-28 June 2008. Danesh Irani, Steve Webb, Jonathon Giffin, Calton Pu, Evolutionary Study of Phishing, General Members Meeting & eCrime Researchers Summit, Atlanta 14-16 October 2008. Shing Yin Khor, Phishing and MySpace, General Members Meeting & eCrime Researchers Summit, Atlanta 14-16 October 2008. Ponnurangam Kumaraguru, Steve Sheng, Alessandro Acquisti, Lorrie Cranor, Jason Hong, Lessons From a Real World Evaluation of Anti-Phishing Training, General Members Meeting & eCrime Researchers Summit, Atlanta 14-16 October 2008. Marc Lelarge, Jean Bolot, Cyber Insurance as an Incentive for IT Security, WEIS 2008 - Seventh Workshop on Economics of Information Security, Hanover NH, 25-28 June 2008. Qi Liao, Zhen Li, Aaron Striegel, Botnet Economics: Uncertainty Matters, WEIS 2008 - Seventh Workshop on Economics of Information Security, Hanover NH, 25-28 June 2008.
comment: An analysis based on complex systems that indicates that the ID theft market has matured, with roughly 500M incidents. The model also illustrates that vulnerability increases with organization size. Kanta Matsuura, Productivity Space of Information Security in an Extension of the Gordon-Loeb's Investment Model, WEIS 2008 - Seventh Workshop on Economics of Information Security, Hanover NH, 25-28 June 2008. Tyler Moore, Ross Anderson, Rainer Boehme, Richard Clayton, Security Economics and European Policy, WEIS 2008 - Seventh Workshop on Economics of Information Security, Hanover NH, 25-28 June 2008. The presentation of Ross Anderson in WEIS 2008. Tyler Moore, Richard Clayton, The Impact of Incentives on Notice and Take-down, WEIS 2008 - Seventh Workshop on Economics of Information Security, Hanover NH, 25-28 June 2008. Tyler Moore, Richard Clayton The consequence of non-cooperation in the fight against phishing, General Members Meeting & eCrime Researchers Summit, Atlanta 14-16 October 2008. Steven Myers, Sid Stamm, Practice & Prevention of Home-Router Mid-Stream Injection Attacks, General Members Meeting & eCrime Researchers Summit, Atlanta 14-16 October 2008. Shishir Nagaraja, The Economics of Covert Community Detection and Hiding, WEIS 2008 - Seventh Workshop on Economics of Information Security, Hanover NH, 25-28 June 2008. Kurt Nielsen, Is Distributed Trust More Trustworthy?, WEIS 2008 - Seventh Workshop on Economics of Information Security, Hanover NH, 25-28 June 2008. David Pym, Adam Beautement, Robert Coles, Jonathan Griffin, Christos Ioannidis, Brian Monahan, Angela Sasse, Mike Wonham, Modelling the Human and Technological Costs and Benefits of USB Memory Stick Security, WEIS 2008 - Seventh Workshop on Economics of Information Security, Hanover NH, 25-28 June 2008. Rod Rasmussen, Laura Mather, Mike Rodenbaugh, Report on DNS Abuse Remediation: Accelerated Domain Suspension Process for Registries, General Members Meeting & eCrime Researchers Summit, Atlanta 14-16 October 2008. Sasha Romanosky, Rahul Telang, Alessandro Acquisti, Do Data Breach Disclosure Laws Reduce Identity Theft?, WEIS 2008 - Seventh Workshop on Economics of Information Security, Hanover NH, 25-28 June 2008. D. K. Smetters, Defending the User: New Approaches to Anti-Phishing, General Members Meeting & eCrime Researchers Summit, Atlanta 14-16 October 2008. Craig Spiezle, User Concerns: Behavioral Targeting vs User Choice, General Members Meeting & eCrime Researchers Summit, Atlanta 14-16 October 2008. Debin Liu, XiaoFeng Wang, L. Jean Camp, Mitigating Inadvertent Insider Threats with Incentives, Financial Cryptography and Data Security '09, Barbados 23-26 February 2009. Hare, Forrest. The Interdependent Nature of National Cyber Security: Motivating Private Action for a Public Good (2011). Moore, Tyler, and Ross Anderson. Internet Security.The Oxford Handbook of the Digital Economy�(Oxford University Press 2011). Cordes, Joseph. An Overview of the Economics of Cybersecurity and Cybersecurity Policy 2011 Developing Cyber Security Synergy (2011): 9. Fershtman, Chaim, and Neil Gandal. Migration to the Cloud Ecosystem: Ushering in a New Generation of Platform Competition Digiworld Economic Journal, no. 85, 1stQuarter. 2012, p. 109. Fershtman, Chaim, and Neil Gandal. Migration to the Cloud Ecosystem: Ushering in a New Generation of Platform Competition Communications & Strategies 85 (2012). Dey, Debabrata, Atanu Lahiri, and Guoying Zhang. Hacker behavior, network effects, and the security software market. Journal of Management Information Systems 29.2 (2012): 77-108. Le, Tien, Akshay Dua, and Wu-chang Feng. kaPoW plugins: protecting web applications using reputation-based proof-of-work Proceedings of the 2nd Joint WICOW/AIRWeb Workshop on Web Quality. ACM, 2012. Norcie, Gregory, Emiliano De Cristofaro, and Victoria Bellotti. Bootstrapping Trust in Online Dating: Social Verification of Online Dating Profiles. Financial Cryptography and Data Security. Springer Berlin Heidelberg, 2013. 149-163. 2012. Dua, Akshay Trust but Verify: Guaranteeing the Integrity of User-generated Content in Online. Diss. Portland State University, 2013. Garg, Vaibhav, Thomas Koster, and L. J. Camp. Cross-country analysis of spambots. EURASIP Journal on Information Security 2013.1 (2013): 3. Groza, Bogdan, and Bogdan Warinschi. Cryptographic puzzles and DoS resilience, revisited Designs, Codes and Cryptography (2013): 1-31. Kaiser, Edward, and Wu-chang Feng. Helping ticketmaster: Changing the economics of ticket robots with geographic proof-of-work INFOCOM IEEE Conference on Computer Communications Workshops, 2010. IEEE, 2010. Orcun Cetin, Mohammad Hanif Jhaveri, Carlos Ganan, Michel van Eeten, and Tyler Moore. Understanding the role of sender reputation in abuse reporting and cleanup. In 14th Workshop on the Economics of Information Security, 2015. Rainer Böhme, Nicolas Christin, Benjamin Edelman, and Tyler Moore. Bitcoin: Economics, technology, and governance. Journal of Economic Perspectives, 29(2):213--38, 2015. Fumiko Hayashi Tyler Moore and Richard J. Sullivan. The economics of retail payments security. In Fifth International Payments Policy Conference: The Puzzle of Payments Security, Federal Reserve Bank of Kansas City, 2015.